As you may or may not already be aware, Monster Hunter World has nuzzled up with the Northern Kingdoms today, as part of its limited-time Witcher crossover. Capcom has previously been a little cagey regarding the specifics of the event, but now, with things underway, it’s revealed all. First things first, it’s worth noting that Monster Hunter World’s Witcher crossover is only available to Xbox One and PlayStation 4 for the time being, but is due on PC at a later date. For those lucky console players, however, the event is available to download now for free. 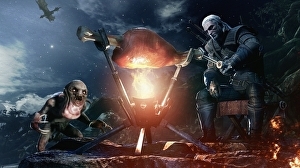 Capcom’s Witcher event is split into two separate parts. The first, a new Special Assignment known as Contract: Trouble in the Ancient Forest, is a wholly solo affair and casts players as Geralt of Rivia – with voice actor Doug Cockle even returning to record some new lines for the project, as you can hear in the launch trailer below.